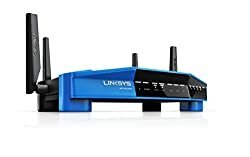 ​If there’s one go-to brand when it comes to routers it has to be Linksys. This company has earned a strong reputation when it comes to trustworthy and sturdy hardware. Now, when it comes to next generation router, this brand definitely delivers too. Linksys routers provide outstanding value for money with their excellent performance in varied applications. From basic Web browsing, to online gaming and video streaming, Linksys definitely delivers. To help you choose the best Linksys router for your need, we’re sharing our top picks today. Featuring Tri-band and dual-band picks that give support up to 4GB of internet speed, our picks includes- something for every need. Whether you’re looking for a simple dual-band router or a mesh solution for large area coverage, Linksys has a solution. 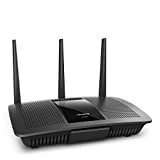 These routers are top of the line and reliable, you’re sure to get the support to make the most of your internet connection. Featuring Amazon Alexa integration and dual-band WiFi combined speed of up to 1900 Mbps, the Max Stream EA5700 is powerful. Supporting 600 Mbps on the 2.GHz band and 1300 Mbps GHz makes it one of the highest performing routers on the Linksys menu. Furthermore, adding support for stable and strong speeds, the Max Stream’s 3x3 wireless-AC tech supports three data streams simultaneously. These speeds coupled with beamforming technology, allows this device to support up to 12 other units at the same time. This beamforming tech gives you stable and strong signal for each device consistently. Plus, it also features MU-MIMO tech supporting multiple devices on Wi-Fi. Apart from great WiFi, it also includes four Gigabit Ethernet Port and one USB 3.0. These support up to 10 times faster wired connectivity for your TV or gaming console. This means clear and fast 4K streaming as well as fluid gaming. And of course, Linksys won’t let you go with that great connection unprotected. So through the Linksys Smart WiFi app, you can manage and monitor security and performance remotely. You can easily manage basic security functions like guest passwords and accesses through this app from any device. Meanwhile, set-up is quick and easy, it’s basically plug and play. You won’t need an installation CD to get it set-up. A few users have been hoping to see Linksys deliver on their posted Firmware updates. A number of users say parental controls could be better. Featuring the latest tech in WiFi including beamforming and MU-MIMO, the Max-Stream EA7500 has a lot to offer. It works great for households and establishments that support multiple devices at a time (including your TV and gaming console). Moreover, it does so with excellent performance and speeds everyone on the network can appreciate. Overall, it’s fast, reliable and strong enough to support multiple simultaneous connections without dropping performance. There’s much to love with this router. If you’re a serious gamer who wants fluid lag-free performance, then the Linksys Max Stream AC4000 is your best choice. 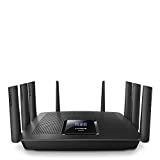 This Tri-band router, designed with six antennas and a 1.8GHz processor, provides excellent performance and a powerful, wide coverage. Moreover, with its beamforming technology you get nine amplifiers extending performance and reach of both frequency bands (2.4GHz and 5 GHz) further. As for speeds, you get a whopping 4Gbps internet speed supported by its powerful quad core CPU and three offloading processors. That’s more than enough for any of your favorite advanced and demanding online games. Plus, you have more to spare for any other users or gamers on the network. Apart from your internet gaming needs, the AC4000 also supports other home network needs. For one, it’s Amazon Alexa compatible supporting voice commands within your smart home network. While you may have other users/devices on your network you don’t compromise gaming performance. Its beamforming tech will make sure you keep your speed and signal for each device stable. Moreover, you can easily manage allocation and access through the Linksys Smart WiFi app. Finally, when it comes to it connectivity hub, you get just what you need. With four Gigabit Ethernet ports and two USB3.0 ports, you have enough for your TV and other gaming consoles or gadgets. Cap all these great features with automatic firmware updates, and you’ve got a great router for your gaming needs. In the previous year, some users were disappointed with the lack of firmware updates. More recent complaints were mostly due to receiving defective units. The AC4000 is undoubtedly a powerful router. It’s powerful enough to host a small network of gamers and power WiFi for a small business. With that, you can imagine how it can be more than adequate for a single gamer to enjoy. Moreover, it gives that high-end performance for a reasonable price. Overall, it’s a powerful router and the most powerful for its price point. It may be excessive for a regular household that doesn’t need this much power. However, if you’re going to spend in this range anyway, this would definitely be worth it. Featuring Tri-stream 160 technology coupled with MU-MIMO tech, the AC3200 supports the fastest speed unlike any other Linksys router. This next generation dual-band router performs twice as strong and consistent performance than its competitors within its class. Since it launched, it has been topping reviews especially when it comes to speed. While its Tri-Stream 160 tech gives you boosted bandwidth, its MU-MIMO tech extends and strengthens its signal. This router gives a whopping max of 2.6 Gbps on the 5GH band and 600 Mbps on the 2.4 GHz. Plus, it has 256MB Flash and 512MB of RAM. Now, the good stuff on the AC3200 doesn’t stop there. This powerful device is also open-source ready including OpenWRT and DD-WRT. This then gives you access to customization options from creating your own VPN and secure Web server to managing hotspots. Moreover, it works with the Linksys app for easy management and monitoring. All these come under a reasonable price tag while continuing to rake in positive reviews. Many of these reviews also note an improvement in both signal and speed. All those features packed in a sleek and appealing body makes it hard to ignore this router. Poor reviews seem to more related to defective units that falter after some use. Most of which are covered by the product’s one-year warranty. A powerful and flexible router, the AC3200 is definitely worth more than a look over. Moreover, it’s a mid-priced router, definitely a router has a lot to offer in speed, control and features. Looking for a powerful router for your high 4K video streaming and YouTube demands? Then you definitely have to check out the L Max-Stream AC2200. Featuring a powerful Quadcore CPU and three offload processors designed for a tri-band router, it gives the best streaming speed. See, the AC2200 can support up to a whopping 2.2 Gbps in throughput. Further boosting its capacity, this router also comes with MU-MIMO tech coupled with Airtime fairness technology ensuring balanced and strong distribution. This means, you have enough bandwidth to share with multiple devices without compromising other activities. It also helps that the AC2200 comes with four external antennas to cover a good area. This gives you stable and strong signals and high speed consistently. If MU-MIMO and Airtime fairness isn’t enough, the AC2200 also comes with beamforming tech. This gives the router six powerful amplifiers allowing you to focus and optimize performance for both frequency bands. Apart from excellent performance and coverage, this router also comes with automatic firmware updates. So you’re sure to get the latest in security and other features. And yet there’s more! The AC2200 also features Amazon Alexa integration and easy management through the Linksys app. None specific to design, it’s few negative reviews were due to defective units. Overall, the AC2200 is one powerful router. It’s sure to meet your video streaming demands while also ensuring good coverage and optimized performance between multiple users. It’s one feature-packed router you can’t ignore if you’re looking for the best. If you’re looking for something that can cover a wide range with unwavering signal, then the Linksys Velop is your best choice. This Mesh system with a range extending up to to 4,000 sq. ft. easily even between walls and corners. Moreover, it covers this much space whilst providing up to 2.1 Gbps of combined speeds over Tri-band frequencies. While it comes up only average of 400 Mbps on the 2.4GHz band, it has two 5 GHz bands that render up to 867 Mbps each. That’s just right for 4K video streaming, basic browsing and online gaming across a large household/establishment. 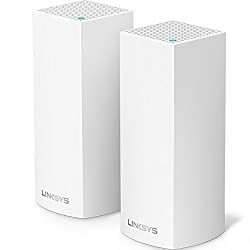 The Linksys Velop also features Amazon Alexa integration allowing you voice command access to various router features. Whether you’re just switching the guest WiFi on or completely shutting down the router. 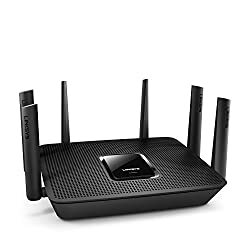 If that isn’t enough for convenience, you can also use the Linksys App for parental controls, monitoring performance, guest access management and other features. A number of users aren’t a fan of its parental controls. Some users found it difficult to set up (not plug and play). With up to 4,000 sq. ft. of coverage, the Linksys Velop takes an easy win for the best in range. However, more than range it provides reliable performance and speed consistently in each corner covered. When we say value, it means that you’re sure to get every penny’s worth and get the best package. So we looked to the Linksys AC5400, a pricey choice but definitely worth every penny. It’s tough to beat in performance plus it’s already Amazon Alexa ready for extra convenience. At first glance, this router already looks promising. This router features eight Gigabit Ethernet ports offering ultra-fast wired connectivity with up ten times speed performance. Meanwhile, it also features Tri-band WiFi coupled with a powerful Dual-core CPU (1.54GHz) for stable and efficient performance among multiple devices. 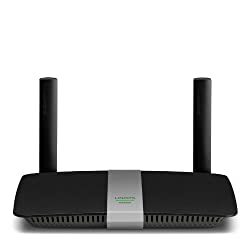 This means lag-free, strong internet connection even with many simultaneously connected devices in your network. Now, when we say ultra-fast, that translates to 1Gbps on the 2.4 GHz band accessible to even older wireless connections. This means wireless N and G connections can go the fastest they’ve ever been. Meanwhile, the AC5400 offers speeds as high as 4.332Gbps on the dual 5GHz bands for 802.11ac WiFi devices. 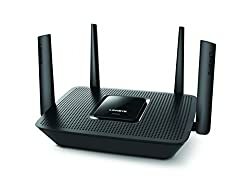 Meanwhile, also supporting excellent performance and connectivity, this router comes with MU-MIMO tech. This ensures consistently optimized signal and performance between multiple devices on the network. If you’re up to extending this performance with other Max-Stream WiFi extenders, you can expect seamless connectivity. With that setup, you can easily build your own Mesh-like WiFi system to expand your WiFi coverage. Overall, if it isn’t overkill for your need and usage, the AC5400 is one powerful, feature-packed router. It gives you ultra-fast speeds over both wired and wireless connections. Plus, it allows you to extend an already large coverage range to suit your need. And while this piece is quite a giant, it comes packed with the performance to meet higher demands when it comes to internet use. Getting a budget router doesn’t mean you have to compromise reliability. With the Linksys EA6350 you get just what you need for your basic internet needs. This router performs more than adequate for a small home or dorm room with a few users. 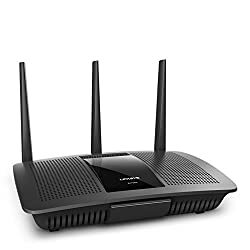 You can connect wirelessly via 802.11n or 802.11ac over a dual-band frequency. With that, the EA6350 provides up to 300Mbps throughput on the 2.4GHz band and 867Mbps on the 5GHz band. If you do mostly basic browsing and moderate streaming this router will fit you well. While it works with a modest reliable speed, the EA6350 features beamforming tech allowing you to better optimize performance within your network. This means enhanced range and signal strength while sustaining fast speeds. Some users feel its range is too short for its price. While seemingly basic and utilitarian, this router blazes through many reviews when it comes to performance and reliability. While other models offer extremely fast speeds, they may actually be overkill for basic needs. With the EA6350 you get excellent performance for a budget price.